Thai cinema is filled with tales of ghosts and spirits that come to haunt or help the living, even in romantic comedies. In the case of The Last Executioner (known as Petchakhat in Thai), it's refreshing to see a Thai film based on true events with a compelling narrative and great videography. The movie tells the story of Chavoret Jaruboon (Vithaya Pansringarm), who was the last man that carried out executions of prisoners by rifle (the kingdom switched to lethal injections in 2003). From behind his rifle scope at the Bang Kwan Central Prison (Bangkok Hilton) in Nonthaburi, Chavoret executes a total of 55 prisoners during his 35-year prison guard career. At the end of the day, however, he's a man who took a job to support his family at a young age. 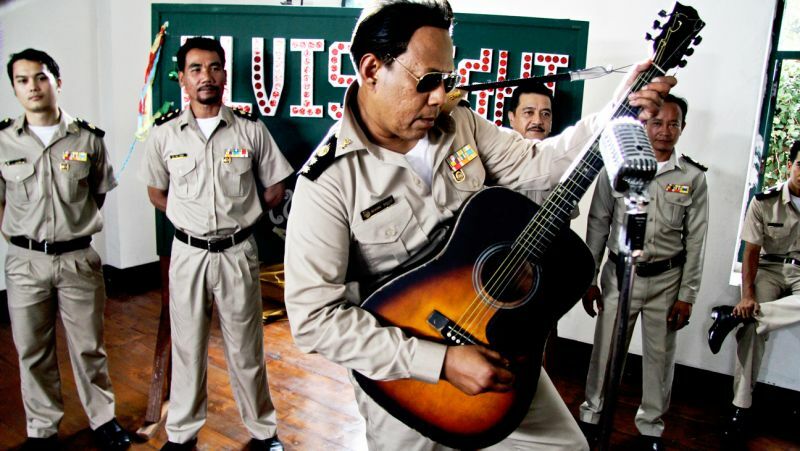 In the 1960's, Chavoret is a Bangkok rock star and has dreams of sharing the stage with some of the biggest musicians in the world, and he's very talented. From the outset, director Tom Waller immerses the audience in this incarcerated world where the prison not only houses criminals but the dreams of Chavoret. The first act jumps from decade-to-decade as we see Chavoret before, during, and after his long-stint as executioner. Throughout the film, Chavoret struggles to cope with the influence his job has on the karma hovering over his family. Carrying out the death penalty comes at a price, and his psyche is constantly playing tricks on him which is manifested in the form of human spirits that follow him. The same three recurring characters pop up as coworkers, mail men, bus drivers, and others as a constant reminder of the price he has paid for dropping one instrument (guitar) for another (rifle). Even as Waller, and screenwriter Don Linder, fall back on the old Thai cinema ploy of spirits, this was the perfect film to employ them. The spirits act as Chavoret's conscience and help force him to accept his job as “the duty” - something he shows no remorse over. Vithaya's stoic performance as Chavoret is outstanding and is fully-deserving of the “Best Actor” award he received at the Shanghai Film Festival in June. Being a guard in the country's most notorious prison leaves little room for anything but a resolute and grim performance, but Vithaya managed to capture the humanity of someone who had clearly accepted his fate. While The Last Executioner is not an analysis of the country's death penalty laws, it's interesting to see the reaction he gets once people learn of Chavoret's job. Everything from “good!” to “you're a murderer!” shows just how subjective the issue had become. The impressive cinematography only heightened the intrigue, especially during the execution scenes. While it's not gory, The Last Executioner does not shy away from accurate (and sometimes, heartbreaking) portrayals of prisoners in their final moments. One such scene, involving a woman, stands out. Overall, The Last Executioner is a great film that is well-paced and beautifully shot. It's a film that audience's can have discussions about, which says something about it's richly-layered narrative.